EL SALVADOR—Last Saturday, October 14, the city government of San Miguel organized a public event about the 100th Anniversary of the Russian Revolution. Many people came, the majority youth. 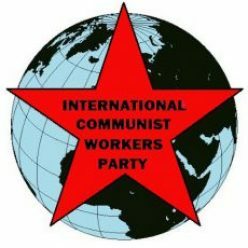 A group of comrades from the International Communist Workers’ Party (ICWP) attended. Before the activity began, we distributed more than 70 copies of Red Flag. The Centennial of the Bolshevik revolution opens up space for us to bring our communist ideas to the masses. A political analyst from city hall began by talking about how the Russian Revolution triumphed, and his point of view on the successes and mistakes that they made. Much of his speech focused on blaming Stalin for the failure of the USSR. One of our comrades opened the debate of a night that would become very interesting. “For decades, capitalist propaganda has attacked Stalin in every way possible. We know that he is not the only one responsible for the errors of the USSR. Socialism maintained the material basis of capitalism. That’s why we must fight directly for Communism,” he said. Other questions arose from the audience in relation to the topic of culture, since a good part of those who attended were artists. They showed part of the film “Lenin” in which a group of people are shown in a theater watching a ballet performance. The workers were outside, and Lenin gives the order that they should be able to enter. It was very interesting to us because many youth have thought that this is the correct way to change the system. However, we know that it cannot be changed if we are not organized under the line of a disciplined party like ICWP. But these young people can join our ranks and become leaders to mobilize the masses for communism. But it’s not that easy. Sometimes we can be idealists and believe that this struggle is quick, but we cannot be sure of this. What we know is that we have a great task to carry out. We have to be confidante that communism will triumph and if we don’t see it ourselves, other generations will enjoy it. That is the love for humanity that characterizes us. The evening ended by touching on a national political issue. They talked about Nayib Bukele, a young politician, ex-fmln, current mayor of the capital, who has become popular in El Salvador. 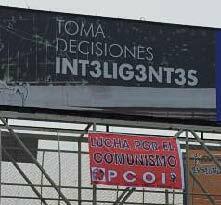 Many want to talk about him because the current electoral parties have no solution to the capitalist crisis. Many are so thirsty for leadership that they have put their faith in this young man who has been the mayor and who will try to be President in 2019. But we must have a clear vision: that anyone, anyplace in the world who is governing under the limits of capitalism will not get us out of this capitalist crisis, because they only seek to reform capitalism, not abolish it. We need to organize ourselves and fight for communism because it is the only solution for the masses. We will continue to attend these spaces which are on the rise to get closer to more youth and adults by distributing Red Flag and our pamphlet Mobilize the Masses for Communism.